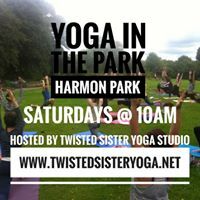 Twisted Sister Yoga Studio is proud to be offering Yoga In The Park this Summer at Harmon Park, Kernersville, NC! This wonderful event is conveniently located to allow us to provide Yoga Kernersville, High Point, Winston-Salem, Greensboro, and the surrounding areas. We believe yoga to be an all encompassing body, mind, and spirit practice. So much so, in fact that it is a practice that is accessible to anyone. No matter your fitness level or state of mobility yoga will help. Twisted Sister Yoga Studio is where you will fit in and have the capacity to heal and transform. Health and happiness, above all, is what Twisted Sister Yoga Studio teaches in our practice. At Twisted Sister Yoga Studio we are passionate about teaching yoga! We offer hatha based yoga classes for all levels. We believe yoga to be an all encompassing body, mind, and spirit practice. It is a practice that is accessible to anyone, whatever your fitness level or state of mobility, Twisted Sister Yoga Studio is a place where you will fin in and have the capacity to heal and transform. Used as a fitness routine, yoga builds strength, and improves flexibility in a way that is not jarring to the skeletal structure. As an individual practicing yoga, you will learn deep breathing techniques, how to connect your breath to yoga postures, improving circulation. As well as experiencing a calming the central nervous system. In the end you are rewarded with an overall improvement in your feeling of well-being. Interested in learning more about our classes, events, Yoga in the Park, and our studio? In that case, please click here, call us at (336)790-1810, or fill out our contact us form.